Following on from part 1 of this article, we are now going to look at gouraud shading and texture mapping. The worst part is actually over, to implement these, and many other features is just a case of stepping a few more deltas along the left hand side of the triangle. The problem with flat shaded polygons is they look like flat shaded polygons, it would look more pleasing if the polygons had a shading across the surface of the polygon. This is basically what gouraud shading is, it assigns a colour to each vertex and the interpolates the colour across the polygon as well. The colour can be specified in two ways, the first is the palletised version which means we only need specify a single intensity value. The second way is true R,G,B gouraud shading, this is where your specify a particular red, green and blue value for each vertex. I will be looking at the palletised idea first as this only involves interpolating a single value. The value of the intensity is usually between 0 and 255, this is the palette index and for best results is a fade between black and another colour. The original way I used to do this routine was to take the intensity at the top vertex and work out deltas, based on the height of the section, to the next intensity. Having the intensity at each side of the current line I used to work out the delta needed during the drawing. If we look at this on a diagram we can work out some of the deltas. There are 2 deltas based on the height of the edge sections for this triangle. The first is for the left hand edge V0 - V1, we will be drawing 50 separate lines (V1.y - V0.y = 50 - 0 = 50), Over these 50 lines we will be altering the Intensity from 50 at the start to 100 at the end, being a change of 50. If we divide the Intensity change by the height distance we get the delta for this edge, (v1.I - v0.I) / (v1.Y - v0.Y) = 50 / 50 = 1, this means for each horizontal line (Y line) we alter the intensity by an increase of 1. The second value we need is for the right hand edge, following the same pattern we get 150 / 100 = 1.5, so for each Y line we move down we need to increase the intensity value for the right hand edge by 1.5. If we look at the first 5 lines we get the following intensity values for the left and right hand edges. Having the intensities for the left and right hand edges we can, for these 5 lines, work out the delta required to take the left intensity to the right intensity over the width of the line. To do this we need to know the width of each line. HANG ON!!!!!!!!!!! What do you notice about those line based intensity delta values???? They are all the same, apart from the first one, but with a line length of 0 it doesn't matter. This is called the 'Constant Delta Value'. This little fact makes the idea of shading a bit easier (And texture mapping and environment mapping...). All we need to do is to work out the constant delta value of the triangle and then we only need interpolate the intensity value down the left hand edge, removing the need to calculate the right delta. We also loose the need to do a division per pixel to work out the delta value ((Right I - Left I) / Width). The best way of calculating the constant delta is to use the longest line, this is because we cannot be sure that the line we use will not have a length of zero which will not provide the correct information. Because of how the previous flat shaded polygon routine was coded there is very little change that is required to make the routine draw a shaded polygon. The first thing we need to do, even before we enter the drawing loop, is to calculate the constant delta. To do this we need to work out the intensity value at the intersect point on the long side, on the same horizontal line as the middle vertex. We have already looked at how to do this when we looked at how to work out the X value of the intersect point. Once we have this value we can subtract the middle vertex intensity from the value we just worked out, then be divide by the longest line, this will give us a constant delta value. Having the constant delta value we just need to calculate the left edge delta. Now the reason for having two separate CalculateDelta() routine becomes apparent. In the CalculateLeftDeltas() routine we need to store the starting Intensity and work out the delta Intensity just as we do for the X deltas. Once we have this information we can simply add the left intensity delta to the current left intensity value every time we move down a Y line. For every horizontal line we take a copy of the current left intensity and then, for every pixel, we add the constant delta value. Because we are using the palletised version we can simply plot this value to the screen and he-presto, a gouraud shaded triangle. The main inner loop looks like the following. Now we get into the nitty-gritty of drawing triangles, the r,g,b version. The code I provide for this routine will only work out a 24bit screen. This means the screen has 3 bytes per pixel, the first is the red value, then the green value and finally the blue value. The alterations to the light triangle routines are VERY small, all we need to do is to, rather that just step the intensity value, we need to do the same calculations on the Red, green and blue values separately. You will need to work out the constant delta for the three values separately, but like in the previous example they are the same throughout the triangle. Be warned that if you intend to write a 16 bit R,G,B Gouraud shader then you will need to mask and shift the colour components correctly. Windows, under DirectX, has two different 16 bit modes, 5:6:5 and 5:5:5. Both of these are valid 16 bit modes, but the first has the 6 bits of green colour while the other only has 5. I always find it easier to check for the mode and have separate routines for each. Just incase here are the 16 bit layouts of each mode. Where R = Red component, G = Green component, B = Blue component and X is not used (leave 0). Texture mapping is essentially the same as the previous two methods. You might start to notice patterns in the routines, this is because the main work was done for the flat shaded polygons, now all we need to do is to interpolate different values across the triangle. 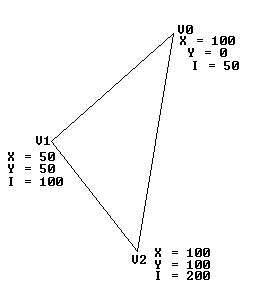 In the case of texture mapping we interpolate a U,V coordinate pair. The U,V coordinates are the point on the texture map. I tend to use square textures that are a power of 2, that is textures with a width and height of 8, 16, 32, 64, 128 or 256. The reason for this is that most 3d accelerator cards prefer power of 2 size textures plus you can speed up the drawing of the texture map if you can rely on this. That's all there is too it. The source code for a texture mapper is here. I hope that this has given you an insight into the world of triangles and how to draw them by hand. It is too easy these days to use the graphics hardware, but sometimes it's nice to go back to basics and look at how it all started. FatMap.txt - This is a very comprehensive guide to texture mapping. FatMap2.txt - An update to the above article. ArthClip.txt - An old article I wrote on polygon clipping. Dranath of TZT, Vampire of TZT - guys, as usual how could this sort of thing be done without your help. Statix - Always good to see your latest stuff, keep up the great work. Anyone else on #ukscene and in the scene in general.